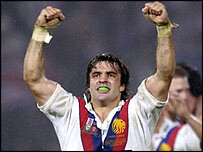 Great Britain winger Brian Carney says Wigan's appalling run of injuries can only help the side this season. The Warriors were without 10 first-team players over Easter but still recorded fantastic wins over St Helens and Hull. Now Carney, who is currently recovering from knee ligament damage, insists the club will go from strength to strength. "Winning without all those players will give the team tremendous confidence," he told BBC Sport ahead of Sunday's Challenge Cup tie with Whitehaven. Wigan coach Denis Betts was forced to call on several youngsters for Monday's game at Hull. And Chris Melling, Bob Beswick, Liam Colbon, plus teenagers Harrison Hansen David Allen, James Coyle and Paul Prescott all played their part in the 21-15 success. "It's great for all those young players to come into winning sides," said Carney. "There's nothing worse than bringing youngsters into sides and getting hammered." Carney also paid tribute to the club's established players. "The senior pros - Kris Radlinski, Brett Dallas and Terry Newton - stood up and put in sterling performances on both Friday and Monday," he said. "The Easter weekend was tremendous for us - and the fact we did so well is testament to the effort the guys put in." Wigan have not only made light of their injury crisis, they have shown that there is life after Andy Farrell, who has decided to pursue a career in union. But Carney strongly refutes suggestions the Warriors will not miss their talismanic captain. "His departure is a huge blow for the club and anyone who tells you differently is lying," said Carney. "You can't overstate the contribution he has made to Wigan rugby club in the 14 or so years he's been here. "But it's not an insurmountable hurdle. The club has lost big names in the past and it will in the future. "We have to move on and evolve. You won't ever replace Farrell." Carney, who played his last game alongside Farrell in Great Britain's 44-4 Tri-Nations loss to Australia, backs his former skipper to impress in union. "He has an unwavering will to win and he'll do whatever it takes to achieve that - and not only in the match but during training, too," said Carney. "Andy is the kind of man who has never failed in his life, and anything he sets his mind to I think he can accomplish. "I don't know whether rugby union fully realises what a great player it is getting."